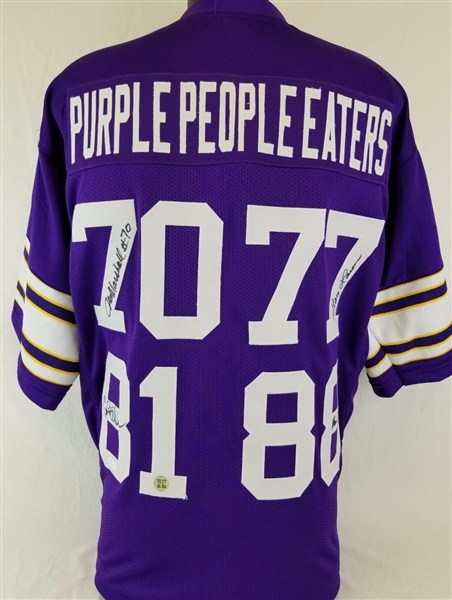 This jersey is signed by the 4 members of the Purple People Eaters, the Vikings dominate defensive line of the 1960's and 1970's. The 4 signatures include Carl Eller, Jim Marshall, Gary Larsen, & Alan Page. The jersey is certified by James Spence Authentication (JSA). It comes with the numbered hologram and matching Certificate of Authenticity. 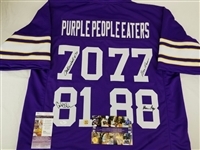 It also comes with the Purple People Eaters authentication hologram and COA made just for the autograph signings these jerseys came from. The item pictured is a stock item. We have several of these available. The one you will receive will be of equal quality to the one pictured. Your satisfaction is guaranteed.